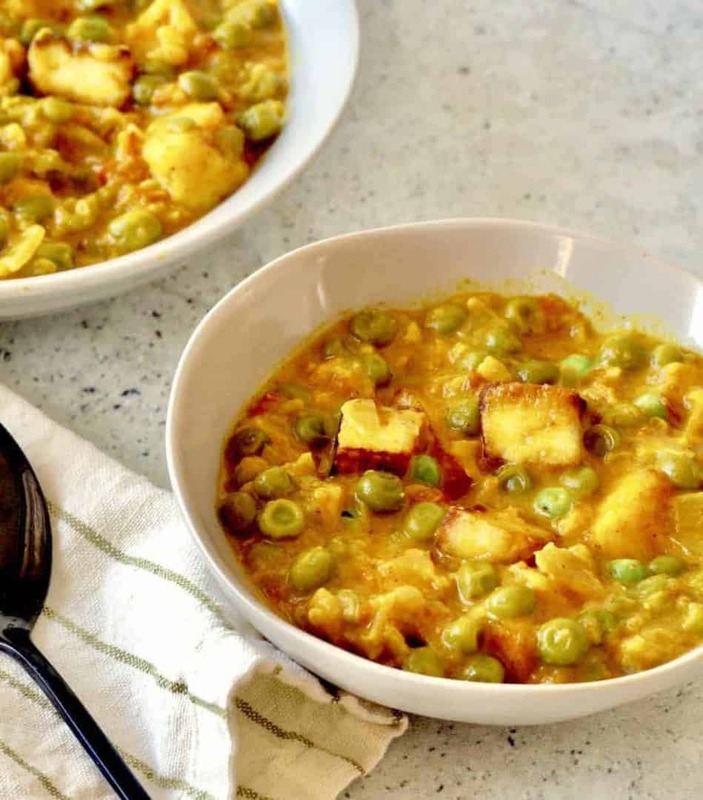 Make restaurant-quality Indian peas and paneer or Matar Paneer in your Instant Pot or Pressure cooker. This is a classic Indian Vegetarian recipe you can make at home in minutes. This Punjabi Style Matar Paneer tastes like dhaba Matar paneer but is ready in about 30 minutes in your Instant Pot or Pressure cooker. Traditionally Matar Paneer is made by sautéing the onion/tomato mixture for what feels like forever. But I’m lazy/efficient so I let the pressure cooker do all the work for me. It seems odd to just throw veggies in there and walk away–but welcome to cooking Urvashi style. For this recipe, you can either buy the paneer ready-made at Indian grocery stores where it is typically in the frozen section, or you can make it yourself using this very easy pressure cooker paneer recipe. At the grocery store, they sell the paneer either plain or fried. 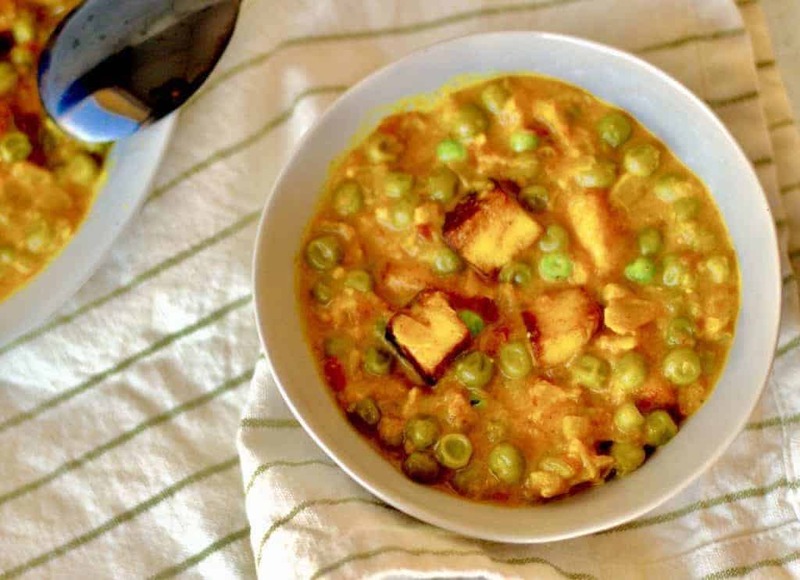 Honestly, they both taste good and I often can’t tell the difference once it has been incorporated into this Matar Paneer recipe, so I suggest you get either of them–or do what I do, which is to get one of each type. Just in case. You will notice that I add water to this recipe in two stages and there are a few reasons I do it that way. You want the vegetables to cook in minimal water to facilitate as much of a Maillard reaction as possible. I often use this technique of water in two stages even when I’m making soups. The more water you have, the longer the pressure cooker takes to come to pressure. By using only the water needed to cook, and adding the rest later, I reduce my overall cooking time. So clearly we have #ruthlessefficiency coming into play here. Vegetables & meat vary a lot with respect to how much water they contain. I find you get much better results by adding water later to control the final consistency. This yields much better results than sautéing after something is cooked to reduce water, as you tend to overcook your ingredients that way. 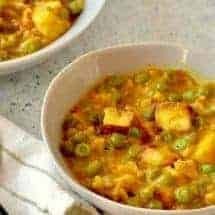 Make restaurant-quality Indian peas and paneer or Mattar Paneer in your Instant Pot or Pressure cooker. This is a classic Indian Vegetarian recipe you can make at home in minutes. For this recipe, the most important thing is to mince the onions and tomatoes relatively finely. You don't want to purée them, but you don't want large chunks. I used my Kuhn Rikon Pull chopper to get small, even pieces. Add all the ingredients listed under Pressure cooking to the inner liner of your Instant Pot and mix well. Cook at high pressure for 5 minutes, and allow it to rest undisturbed for 5 minutes. Then release all remaining pressure. Turn your pot on Sauté. Add remaining 1/2 cup of water now. (Please read the post to understand why the two stage water additions). Add the remaining ingredients and allow them to heat through, stirring occasionally, for about 5-8 minutes. Although I have provided nutritional information, I don't entirely trust it as it will depend a lot on the type of paneer you use. Please calculate macros based on your final ingredients. This recipe was made in a Mini and a 6-quart duo. If you use an 8-quart, either double the recipe or add an extra 1/4 cup water to the pressure cooking cycle. I LOVE the taste of Paneer. I’m often the one who is found of Paneer so I am so happy about this Paneer recipe! Love how easy it is too , thanks for sharing idea with us. Tried this recipe tonight with storebought paneer. We liked it very much! Looking forward to improving on what I did tonight, though. First, making the paneer myself. Second, some minced green chilies (jalapeños or serranos) for a little fuller flavor than the cayenne – though we liked the heat. Lastly, I think because we use kosher salt, the salt level needs to be kicked up a bit – I used about 2/3 tsp of kosher (always wary about using too much), so next time i want to get closer to a full tsp. Can’t wait ti try this (and other) Two-Sleevers recipes in the future! Hi there. This was unbelievably easy and delicious. I could have used less additional water – cooked it down a bit afterwards. I wonder though, why is there oil added, if we are not sautéing the onions? Can I use red chilli powder in place of cayenne? So delicious and so easy! I used frozen peas and tinned tomatoes and it turned out great – the pan fried paneer was also a nice touch. Thank you Urvashi! 😋very good meal. I cut the cayenne in half and thought it still had plenty of kick. Is there any benefit to sauteeing the onion before adding the other ingredients? It felt odd to just throw everything in and start pressure cooking..
Can I use canned diced tomatoes and frozen peas for this recipe? I tried this and it turned out really good.. I added red peppers and salt. Rejoice in the glory of India and freedom fighters on this republic day. We wish you all A Happy Republic Day and Vande Mataram..